Congratulations to the 2010 Graduating Seniors! This entry was posted in Dance, Theater on June 9, 2010 by lclark1. An evening of classical and contemporary Indian dance presented by the “Courtyard Dancers” www.courtyarddancers.org. “Emo-Sketches” is a journey through the emotional landscapes of love, justice, humanism, and hope using Kathak dance, rhythm, poetry and gestures. The concert will also feature Mohiniattam exponent from India Priyadarshini Ghosh Shome. 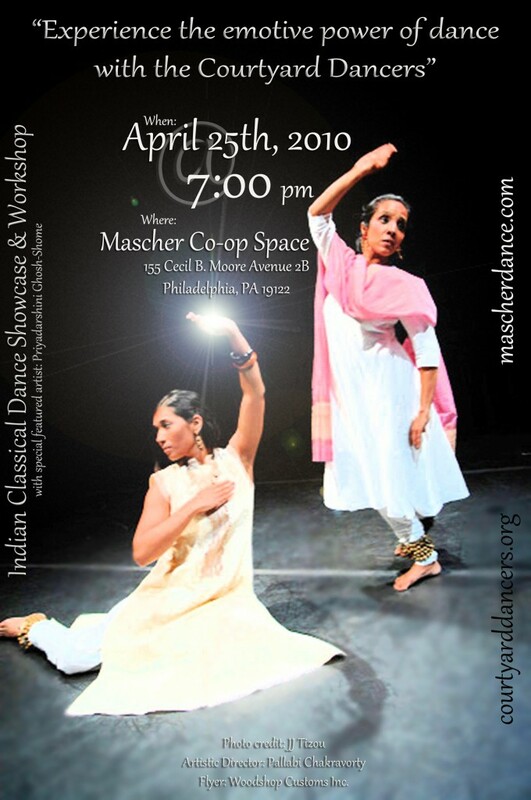 The performance showcase will culminate in a classical Indian dance workshop with the audience members. No prior knowledge of dance is necessary. About the company: Courtyard Dancers, a diverse body of performers, creates and stages contemporary Indian dance theater based on classical Indian and folk dance forms. Our mission is to explore through our works the interdependence between art, life, and labor. In this, we are interested in developing a socially engaged community of artists and audiences who experience art and culture both in political and aesthetics terms. We juxtapose the beauty of the classical forms with pedestrian movements, everyday gestures, utterances, and text to create our own collage of life. We draw on the expressive power of Indian dances to narrate stories of the under-represented and the marginal, the quotidian, and the mundane to evoke dramatic and powerful images of ordinary life. Through our dance theater, we strive for sustainable and pluralistic communities that can acknowledge and bridge differences. This entry was posted in Dance, Uncategorized on April 16, 2010 by lclark1. We look forward to seeing you in class! If you are planning to participate in a class, please contact the instructor about appropriate attire. For more information contact Liza Henty-Clark at lclark1@swarthmore.edu or (610) 328-8260. For information about the Dance Program see our website: www.swarthmore.edu/dance. This entry was posted in Dance on April 13, 2010 by lclark1. Kim Arrow’s videography MOCEAN received an award for the “Most Creative” category from films selected to be screened for Earth Hour 2010 on March 27th in Cairns, Australia. Sponsors include World Wildlife Fund, Great Barrier Reef Marine Park Authority, Cairns Regional Council, and Ergon Energy. Earth Hour was a global effort involving an estimated one billion people who came together with recognition of climate change by turning off their lights for one hour. Kim Arrow, Director of Swarthmore Taiko, will perform with the group for the Morris Arboretum’s Cherry Blossom Festival, in North Philadelphia on April 17, 1PM. Swarthmore Taiko will be the opening performance for the Haitian Benefit Concert in Lang Performing Arts Center, Swarthmore College, on April 1, 6:30 PM. Mayoral Press Conference for the Japan/America Society’s 2010 Cherry Blossom Festival, Fairmount Park, Phila. MOCEAN, a dance video created by Associate Professor Kim Arrow, will be screened for EARTH HOUR 2010, at The Pier at the Marina, Cairns, Australia, sponsored by Cairns Regional Council, World Wildlife Fund, the Great Barrier Reef Marine Park Authority and the Australian Government, on March 27. Dance Advance, a program of the Pew Center for Arts and Heritage, awarded a grant in the amount of $20,000 to Asst. Professor Jumatatu Poe to rehearse and develop a new work, Flatland 2010. This highly competitive grant was awarded to 16 Philadelphia-based choreographers, companies and presenters. To learn more about Prof. Poe’s work, we invite you to visit his company’s website: www.idiosyncrazyproductions.com. This entry was posted in Dance on March 26, 2010 by lclark1. Join us for STANDING AT THE EDGE: WE DANCE, A Documentary on the Life of Joan Myers Brown! This entry was posted in Dance on March 23, 2010 by lclark1. Trisha Brown Dance Company at Swarthmore this Thur-Fri! The Trisha Brown Dance Company has presented the work of its legendary artistic director for more than 37 years. Founded in 1970, when Trisha Brown branched out from the experimental Judson Dance Theater to work with her own group of dancers, the company offered its first performances at alternative sites in Manhattan’s Soho. Today, it is regularly seen in the landmark opera houses of New York, Paris, London, and many other theaters around the world. The repertory has grown from solos and small group pieces to include major evening-length works and collaborations between Brown and renowned visual artists. The program presented at Swarthmore will include “You can see us” (’95), “Foray Foret” (’90) and the classic “Set and Reset” (’83). These dances showcase Brown’s frequent collaboration with artist Robert Rauschenberg. This event is made possible in part by a grant from the National Endowment for the Arts. Cooper Series events are free and open to the public; there is no reserved seating. Event details may be subject to change without notice. This entry was posted in Dance on February 23, 2010 by lclark1. The Faculty and Friends Dance Concert has been cancelled due to the snow storm. We apologize for any inconvenience. This entry was posted in Dance on February 6, 2010 by lclark1. Join us for the Faculty and Friends Dance Concert this Sat, Feb 6! The concert is in honor of the people of Haiti. Donations will be collected for earthquake relief efforts before and after the concert. The performance will feature an exciting variety of works by faculty and alumni. Group work includes a female quartet choreographed by Sharon Friedler, inspired by the sculpture of Phillip Stern ’84, with live harp music played by Johanna Bond ’10. C. Kemal Nance ’92 will surprise us with a new duet based in the Umfundalai African dance tradition, while Jumatatu Poe ’04 and Joe Small ’05 have crafted a duet melding post-modern dance techniques and Taiko rhythms. The Lenny Seidman Tabla Choir offers a new composition based on a nearly extinct North Indian drumming tradition. Dancer Liza Henty-Clark ’03 will join pianist Christopher Henty-Clark in a dance homage to pregnancy and birth. Solos include a work depicting the aesthetic and political dimensions of Kathak dance and Ghazal poetry, choreographed and danced by Pallabi Chakravorty. Sally Hess will treat us to a solo inspired by the ceremonial actions of a Japanese tea ceremony. And Jeannine Osayande offers an excerpt from a dance-theater work that uses the communicative power of dance to share her experiences as a fourth generation African-American raised in Swarthmore. Finally, Kim Arrow will share a dance film created during his residency in Australia. The performance is free and open to the public without advance reservations. For more information contact Liza Clark at (610)328-8260 or lclark1@swarthmore.edu. This entry was posted in Dance on February 2, 2010 by lclark1. For more info see: www.understandingdance.com. This entry was posted in Dance on November 17, 2009 by lclark1.